If we are to share God’s Word, Love, Truth, Mercy and Saving Grace throughout the world, we should take determined steps to become equipped to do the Lord’s work. There are thousands of Christian websites that contain excellent resources to assist you in becoming equipped, before going out into the world, for the purpose of delivering the Gospel of Jesus to those needing to hear it. Saved By His Grace recommends the following websites as excellent resources for that purpose. This list is not all-inclusive, however, the sites listed have excellent materials available to grow in the knowledge of Christ and His Word. 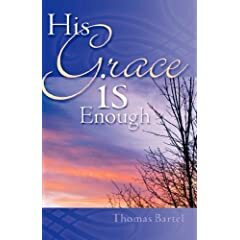 “His Grace is Enough”, is available at Amazon.com and other online bookstores. Simply click on the picture if you would like to order a copy.